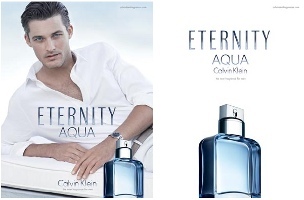 Calvin Klein will launch Eternity Aqua, a new woody aquatic fragrance for men, this spring. The new scent is "about effortless elegance and refinement, but with a little zest". The notes feature chilled cucumber, citrus, water lotus, green leaves, Szechuan pepper, mirabelle, lavender, white cedar, sandalwood, guaiac wood, patchouli and musk. I really like this ad its so classic Calvin Klien I really like it.The notes sound interesting.I am not a fan of flankers but this looks like a nice refreshing change. This sounds strangely appealing to me despite being turned off by the word “Aqua” in the name & the chilled cucumber top note. I like cucumber on its own or as the dominant thread (I got a real thrill out of MJ’s Cucumber Splash), but somehow it doesn’t jive well with the rest of the notes for me. I doubt there will be any revelations in this fragrance, but I’ll definitely give it a sniff! I’m not a fan of aquatics, but will give it a shot if I see it! ACK! sorry, but cucumber is right up there with apple and raspberry! Deal breaker supreme. Not a big fan of cucumber either. cucumber is one of those notes, like Vanilla or Coconut or Peach that I CANNOT get enough in fragrance and is truly underused, would die for and love a fragrance that would blend Cucumber, Watermelon, and Peach…. NICE!!!!!!! Ah yes. Well, he looks pretty good either way, but you’re right…he does look good in a beard. And I almost never like beards. DEATH TO FLANKERS… Well… Maybe to most flankers…. or even just a handful… oh hell! LONG LIVE FLANKERS!!!! YEA!! this sounds GORGEOUS! I am DROOLING over the notes and desperately want a bottle, Love the Color, Love It ALL! GIMME GIMME GIMME! i’m going to buy it!better than gucci’s new perfume anyway! I tried this out today and I must say that I was surprised at how good the scent was. It was nothing groundbreaking or out of this world but it smelled very modern and fresh. I’m probably going to purchase it tomorrow since I enjoyed it so much. I just purchased this cologne…no, it’s not ground breaking, but it is nice. It is perfect for wearing into the office, it is inoffensive. Eternity for Men Aqua is well blended in the way that it is very marine and yet woodsy too; it smells of a wet dock without the musty, swampiness to it. It smells of a marina, wet dock warming in the sun. The woods are light and dry for a marine scent. This cologne is perfect for Spring and Summer, wearing into the office, for a casual, laid-back weekend. It will wear well with a t-shirt, or a crisp white button-down shirt. Yes, it may be just another flanker, but it is better than previous iterations. The longer it is worn, the better it gets.